Situated in the Mestalla neighbourhood, the area around the Avenida Aragón is one of the best in Valencia. The area connects the Turia Gardens with Avenida Blasco Ibáñez, one of the city’s major arteries. 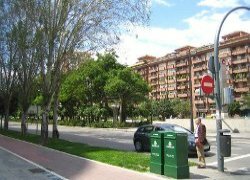 Avenida Aragón is a wide street, full of light and plots of green areas along the centre. It enjoys a fantastic location, very close the the centre and the university, and is situated near the football stadium at Mestalla. The sea is a mere 5 minute car journey away, and the north and south city limits are also nearby. The Aragón metro station is located in the centre of the Avenida de Aragón, facilitating movement around the city. Many bars and restaurants are found around Aragón. The combination of office buildings and university campus buildings in Mestalla create a colourful area. The majority of the buildings were constructed recently and are of high quality. There are plenty of services just a stone’s throw away and many prestigious schools are located in this neighbourhood and its surrounding area. The Turia Gardens, the park constructed in the old riverbed, are very near to this area. It is the perfect place to go for a walk or play sports and is a very convenient way of getting from one part of the city to the other. 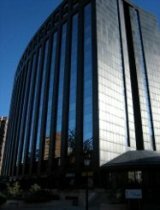 One of the landmarks of the Avenida de Aragón is the Europa Building, a modern and imposing office block with a dark facade that reflects the avenue in its shining columns. Many important businesses have their Valencia headquarters in the Europa Building. Naturally, the Mestalla stadium, the ground where Valencia CF plays, is the biggest building in this area. With a capacity of 55,000 spectators, the area is inundated with people on match days, whether at the stadium itself or watching the game in nearby bars. Valencia CF plan to relocate their grounds in the next few years, leaving the existing area of Mestalla to be used for a shopping centre and a hotel. Browse Avenida Aragón property for sale listings.